Does your company need to improve its 401(k) plan? Reduce administrative or investment costs? 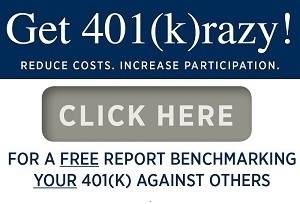 Get “401(k)razy” and contact us for a free evaluation and benchmarking report! This free report helps you understand how your plan is performing versus its peers with regards to costs, participation, balances, investments, features, and more, which will allow you to determine if an upgrade is necessary. Click on the Email Us button to request a report. What investment choices should I use? Is this the best plan possible? When is the last time we reviewed the plan design, investment choices, and costs? How much does this really cost us/employees? What’s our responsibility and where are we vulnerable? Who is our 401(k) rep? Where are your Plan Documents? Adoption Agreement, Discrimination Test, Census Data? When is the last time you reviewed your plan? Where is your Investment Policy Statement? Investment contract? Where is your IRS Form 5500? How do you disclose plan fees?